Home / world / The stakes will be high for both the government and the opposition in Venezuela's municipal elections on Sunday. The stakes will be high for both the government and the opposition in Venezuela's municipal elections on Sunday. According to David Smilde, a senior fellow at the Washington Office on Latin America, the results of the vote for mayors and town councillors will be a test of the government's popularity. "This is the first election since April, when Nicolas Maduro just barely squeaked by," he says referring to April's presidential election when Mr Maduro won by an unexpectedly narrow margin of 1.5 percentage points. The opposition, led by Henrique Capriles, contested the result, alleging there had been irregularities. But the National Electoral Council carried out a recount and declared the results valid. The country became more divided than ever in the wake of the vote. 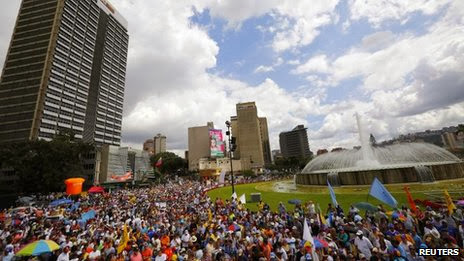 Opposition supporters questioned the legitimacy of the new president, while Chavistas - as supporters of the late President Hugo Chavez are known - accused the opposition of trying to stage a coup. The municipal elections could be an indication of how voters feel eight months on, but analysts think there is little chance of there being a clear winner. "Both sides may be able to declare victory on 9 December, depending on what you define as victory," says Eugenio Martinez, an election analyst working for the pro-opposition newspaper El Universal. "There are 337 different elections on Sunday" he says referring to the number of mayoral posts up for grabs. According to most polls, the government coalition looks likely to win in a majority of municipalities. What is less clear is whether it will be able to take control of the country's two largest cities, Caracas and Maracaibo. But both the government and the opposition have argued in their campaigns that Sunday is about much more than choosing local representatives. From the start, the opposition has portrayed the vote as a referendum on the performance of Mr Maduro, whom it blames for Venezuela's economic woes. The government, on the other hand, wants to be able to show it can count on the support of the voters at a difficult economic time. Victory is therefore important to both camps, but the stakes seem higher for the opposition. "The opposition trapped itself," says Julio Escalona, Venezuela's Deputy Ambassador to the United Nations. "They told their voters that these are decisive elections. But they may not win, and that would become a serious political problem for them," he told BBC News in a telephone interview from New York City. Mr Smilde also believes the opposition has been losing ground. "Until the end of October, it looked like the opposition was in the driver's seat," he says. Ignacio Avalos, who heads the Venezuelan Electoral Observatory, a NGO which has often been critical of the government, says the opposition has been facing an added difficulty. "The worry is that the campaign was very uneven, there was no fair play," he says. Among other things, Mr Maduro declared 8 December as a day to commemorate the memory of the late president Hugo Chavez. The government says it chose 8 December as the "Day of Loyalty and Love towards Chavez and the Motherland" because it is the first anniversary of Mr Chavez's famous speech, when he announced the re-occurrence of his cancer and asked voters to pick Mr Maduro as the new president if he were not to return from cancer treatment in Cuba. In a statement, the Venezuelan Electoral Observatory said Venezuelans "are facing the risk that the commemorative acts and events may become acts aiming at recruiting votes for the candidates supported by the executive power". "The principles of equity and equality established in our legislation would thus be violated," the statement warns. But analysts say that despite the recent polls suggesting increased approval of the president's performance, the government coalition may not fare much better in Sunday's election than in its razor-thin win in April. Some critics say a poor performance could lead to internal divisions within Chavismo.. But Mr Escalona thinks a partial defeat will only spur the government on in its performance. "If the government loses the main cities, it means that they will have to do a better job in the future," he assures. "Chavez's legacy still has a vital importance within Chavismo.. I don't see any reason for a political fracture. There are many reasons to remain united," he says. "No matter the result, [Nicolas] Maduro will remain the president. But the opposition needs this victory to show its strength," he says.